Christian Hip Hop Artist Rafael was born as Bryan Cabrera. He was raised in a single-family home with his mother and younger brother. He was born in Los Angeles, California and later relocated to Dallas Texas. Growing up, Rafael always felt something missing in his heart. Mostly due to his father being absent from his life. It was the foundation to Rafael’s major depression. Rafael felt incomplete and the longing to know his father hunted him. Almost on a daily basis, he could not find peace in his life. Eventually, he started working out at the gym as a coping mechanism. It helped him regain a little peace. However, when he met Pastor Randy Jones he was told that Jesus loves him. Pastor Randy encouraged Rafael and informed him that he has a purpose in life. Since then, Rafael’s life changed tremendously. Pastor Randy taught him how to allow God to become the father he never knew. He quoted Psalms 89:26 and stated: “you are my father my God and the rock of my salvation”. After 2 years of devoting a lifestyle of discipleship, Rafael felt a calling to tell the world about Jesus through music and personal testimonies. It’s the belief of Rafael that God has given him a Divine appointment to minister to a target audience. A revelation came to him in a dream which he saw himself performing on a stage. 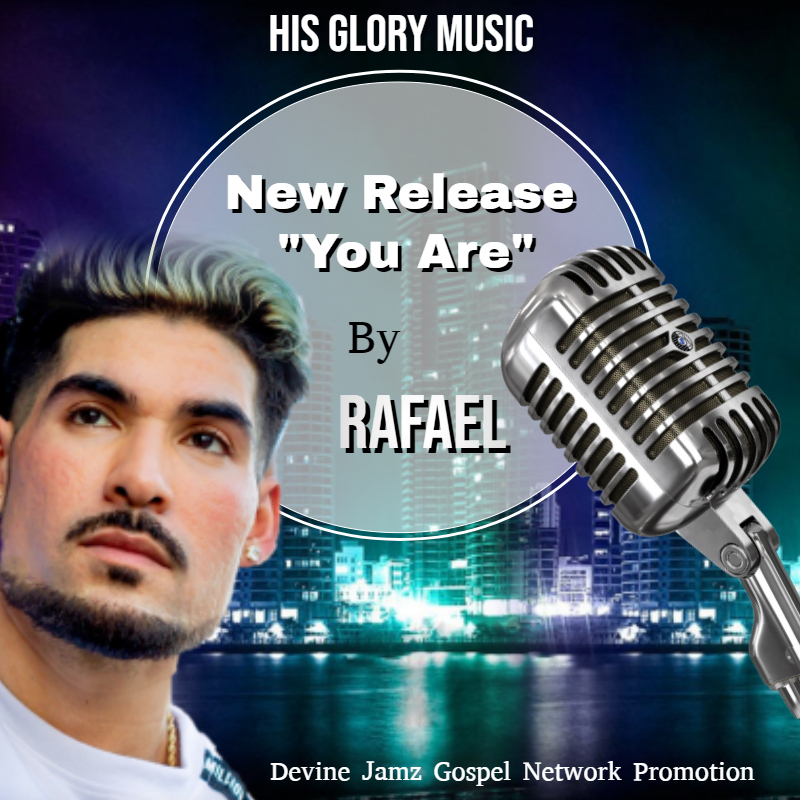 One can say that Rafael certainly has a gift to sing and it’s revealed in the song “You Are” that was co-written with Pastor Randy and two other songwriters. Rafael no longer feels defeated or like a victim of depression. He is very grateful that God is the rock of his salvation. 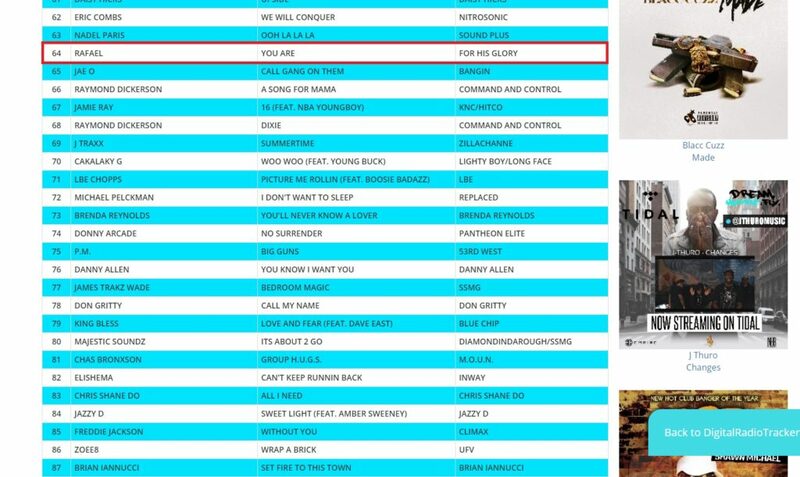 The song “You Are” is a highly favored upbeat track to play by radio programmers. 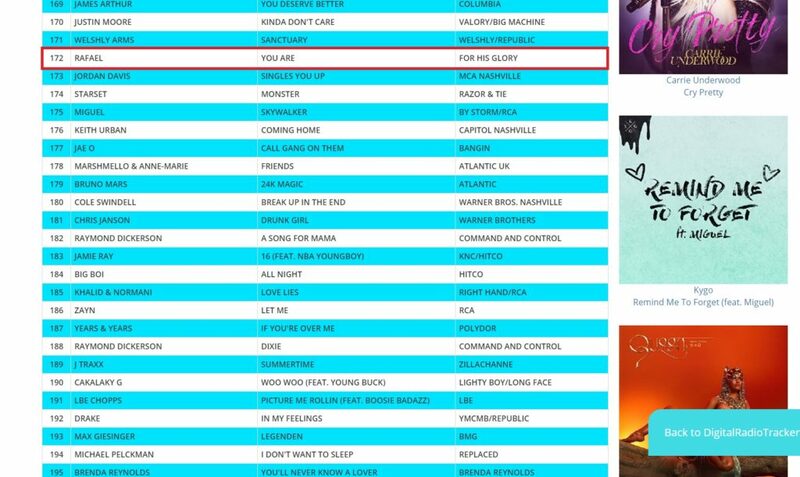 Christian Radio Stations around the nation has reported over 1,008 spins for the song in the 1st week of airplay. 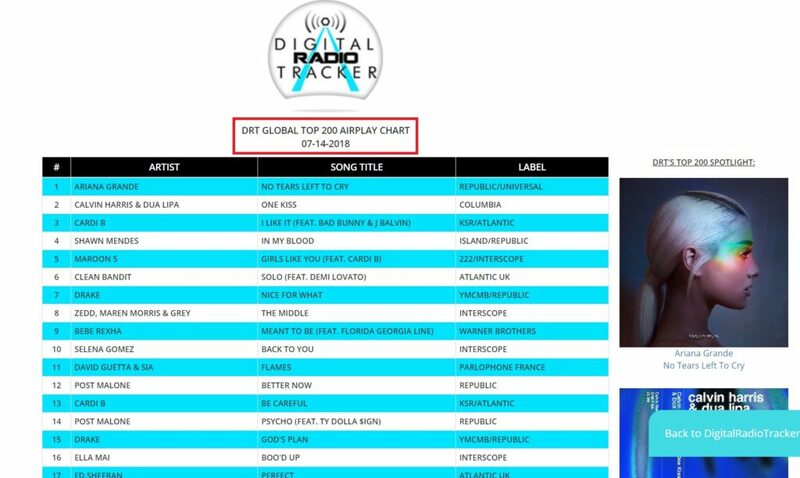 The song was also placed on DRT GLOBAL TOP 50 GOSPEL/INSPIRATIONAL AIRPLAY CHART at #8, Global Top 200 Airplay Chart at #172, and Global Top 150 Independent Airplay Chart at #64. 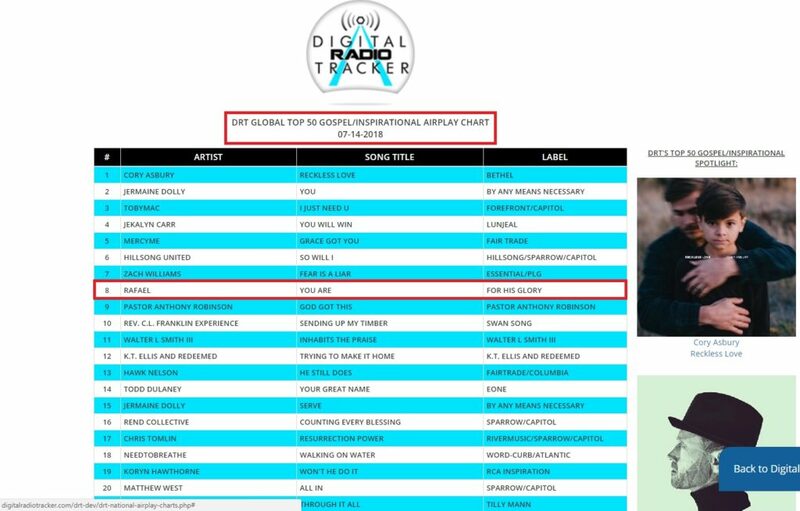 This rank the song on 3 separate charts in the 1st week of airplay. 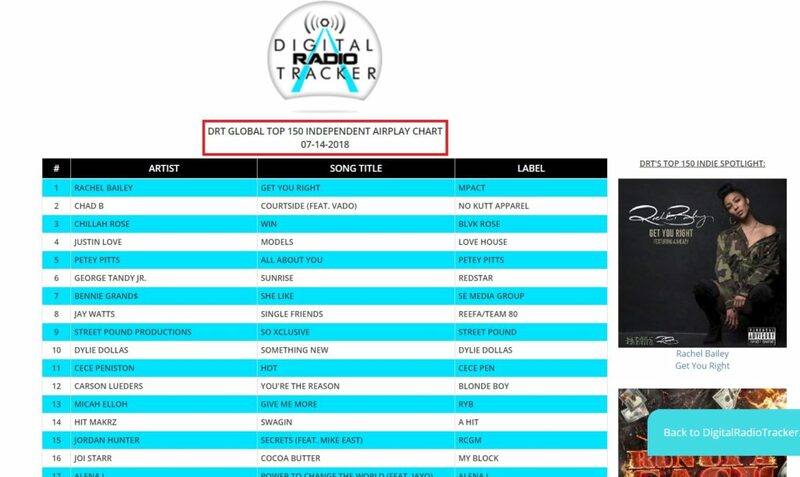 DJ’S and programmers are really taking a liking to the track. Get connected with Rafael on Social Media Networks for all his news updates and more. After 2 years of devoting a lifestyle of discipleship, Christian Hip Hop Artist Rafael felt a calling to tell the world about Jesus through music and personal testimonies. It’s the belief of Rafael that God has given him a Divine appointment to minister to a target audience. A revelation came to him in a dream which he saw himself performing on a stage. One can say that Rafael certainly has a gift and it’s revealed in the song “You Are”. He co-wrote the lyrics with Pastor Randy Jones and two other songwriters.